In contemporary times, religions’ identity is being used as cover for political agenda. Be it the terrorist violence or the sectarian nationalism in various parts of the World, religion is used to mask the underlying politics. While one was talking of separation of religion and politics many decades earlier, the times have been showing the reverse trends, more so in South Asia. Globally one came across the news that American President sent a chador [a ceremonial sheet of cloth] to the annual observation at the shrine of Khwaja Moinuddin Chishti at Ajmer. (April 2015). Later one also read (April 22, 2015) that Sonia Gandhi, Atal Bihari Vajpeyi, and Narendra Modi has also offered chadors at the shrine. Keeping the relation between state, politics and religion apart, it is interesting that some traditions within religion have appeals cutting across the religious boundaries. The Sufi and Bhakti tradition in Pakistan-India, South Asia are two such humane trends from within Islam and Hinduism respectively, which harp more on unity of humanity as a whole overcoming the sectarian divides. The saints from these traditions had appeal amongst people of different religions and they were away from the centers of power, unlike the clergy which was close ally of the rulers in medieval times. 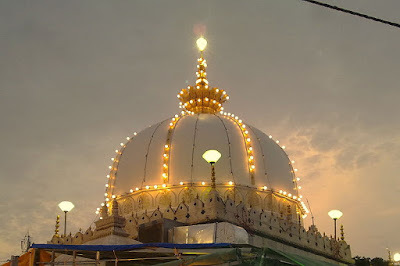 We have seen rich traditions of people like Kabir, Tukaram, Narsi Mehta, Shankar Dev, Lal Dedh, clearly from within Hindu tradition, while Nizamuddin Auliya, Moinuddin Chishti, Tajuddin Baba Auliya, Ajan Pir, Nooruddin Noorani (also known as Nund Rishi) coming from a clear Islamic Sufi tradition and Satya Pir, Ramdev Baba Pir, having a mixed lineage where Bhakti and Sufi themselves are deeply intertwined. In today’s scenario the global discussion has been centered round religion due to its use in political sphere. Now the renewed interest in Sufi tradition at one level is heartening. Sufism has been prominent in South Asia from last ten centuries. Word Sufi means coarse wool fabric, the type of clothes which were worn by Sufi mystics. It grew within Shiaism but over time some Sunnis also took to this sect. It has strong streaks of mysticism and gave no importance to rituals and tried to have understanding of God by transcending the anthropomorphic understanding of Allah, looking at him more as a spiritual authority. This is so similar to the belief held by Bhakti saints also. Many Sufi’s had pantheistic beliefs and they articulated their values in very humane way. In the beginning the orthodox sects started persecuting them but later compromises were struck. The Sufis formed the orders of roving monks, dervishes. People of all religions in many countries frequent their shrines, this again is like Bhakti saints, who have following amongst people of different religions. On parallel lines Bhakti is probably the most outstanding example of the subaltern trend in Indian religious history. The Bhakti saints came from different streams of society, particularly from low caste. Bhakti opposed the institutionalization of religion, tried to decentralize it, and declared that religion is a private matter. It gave respectability to the separation of state power and religion and merged the concept of God worship with the process of getting knowledge. Travails of poor people are the focus of bhakti saints’ work. Bhakti traditions gave respectability to many low castes. This tradition had inclusive approach towards Muslims as well. This tradition posed a challenge to upper caste hegemony. Bhakti tradition opposed the rituals, hegemony of elite of society. They adopted the languages more popular with the masses. Also they talked of one God. In India in particular Hindu Muslim unity has been one of the concerns expressed by many of the saints from this tradition. What one needs to realize is that there are various tendencies with every religion. The humane one’s as represented by Bhakti and Sufi are the ones’ which united Humanity and harped on morality-spirituality of religions. The intolerant tendencies have been usurped by political forces for their political agenda. In sub continent during the freedom movement the declining sections of society, Rajas, Nawabs, Land lords came up with Muslim and Hindu Communalism to begin with. This nationalism in the name of religion had nothing to do with morality of religions. It was use of religion’s identity for political goals. In the national movements we had people like Gandhi, Maulana Abul Kalam Azad who were religious but opposed to religious nationalism. The essence of Sufi and Bhakti tradition are reminders to us that spirituality, morality part of the religion has been undermined in the current times. The inclusive-humane nature of these traditions needs to be upheld and the divisive-exclusionary versions of religions have to be ignored for better future of humanity. Where do Ram and Allah Live?